It has been generous of my friends to take their time to write up the answers to a barrage of questions and share their stories of living car-lite, here on this blog. This is Hannah’s account of how their family has traveled about Huntington, WV. To read the first two interviews in this series, please see: Klover/Kittinger and the Hobson/Greens. I hope you enjoy learning a little more about another great Huntington family and their reasons for living with one less vehicle. All photos are courtesy of the family. 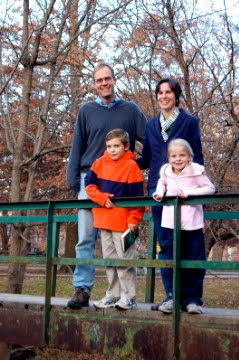 We are a family of four: Tim, Hannah, Peter (9), and Claire (7 1/2). We own one car (a 2004 Honda Odyssey) and we each have a bike. Here’s the history of our car ownership. Tim and I both owned small, two-door sedans before the kids were born. We purchased a ten-year-old Volvo station wagon when Peter was about 9 months old (we thought it was the professor-ly thing to do), so we donated one of our cars to Good News Mountaineer Garage in Charleston. (By the way, this is a great organization.) Then at some point down the road (I can’t remember at exactly what point) we decided we could make do with just one car, so we donated the other sedan to Good News. Then, when Claire was three, we were able to purchase our used Honda van (with some generous financial help from my parents). We decided to hang on to the wagon, since it was paid for, and my parents ended up using it during the summers (they live in California but used to spend the summers in the east, so they flew to Huntington for a couple of years, picked up our wagon, and used it for the summer on their travels). In the summer of 2009, when my parents had driven the wagon up to Massachusetts, my mom was hit by a rookie policeman, who was making a bad left turn, and the car was totalled. To be honest, Tim was thrilled! He really didn’t like the Volvo, and our insurance company payed us the full book value, which was significantly more than anybody would have paid us for it. I can honestly say that I am very grateful for that police man who hit our car, because it has simplified our lives tremendously to be back to one car. We feel like we’re being better steward of our resources, and helping the earth out in the process. One reason that it is doable for us to have just one car is that Tim can bike or walk to work easily. Only on very rare occasions does he drive the car to work, or do I drop him off at Marshall. He genuinely enjoys his bike ride to work, and in the winter when it is too icy to bike, he can get to school on foot in about fifteen or twenty minutes. We are only about a five minute bike-ride from our church, ten minutes from the kids’ school, two minutes from the YMCA, and about five or ten minutes from downtown. So, we are truly blessed in terms of our location. It would, of course, be significantly harder to have just one car if we lived further away from these places. Tim doesn’t travel much for work, but when he does occasionally go to a conference, either he or I will rent a car (do you know about Enterprise’s weekend special? About $35 for three days – Friday through Sunday). I work from home very part-time – I teach about six private violin lessons a week. I use the car to go grocery shopping (once a week), to run an occasional errand, and to drive the kids to and from school in bad weather. I do order some things online, but I also go out to the mall every once in a while (I do try to wait to go until I can kill many birds with one stone!) During soccer season, we make a trip out to the Kennedy Center on Saturdays, which of course uses more gas, but I can also combine trips to the mall with trips out there, so that helps. It would be great if the city of Huntington would consider finding a way to put in bike paths*. When we ride with the kids, we ride primarily on the sidewalks, which I believe is actually illegal downtown* (I asked a policeman one time about this, and that’s what he told me). I also think it would be great to have community leaders encourage people to consider living in Huntington, as opposed to Barboursville, Milton, and Ona. I know there are some folks who really feel called to live in the country, but it seems like there is potentially a lot of good housing in Huntington that goes unused. We really love living close to everything and often feel bad for our friends who have to drive 20 minutes just to go to the library, or something like that! *Stacy’s Note: Huntington is working on installing bike paths and it is illegal in WV to ride on the sidewalks. By and large I would say that having one car as opposed to two is a huge blessing. Even just keeping track of basic maintenance like oil changes on two cars seemed to complicate our lives considerably! Having just one car forces us to bike and walk more, too, which is of course a win-win situation: it’s good for us, it’s good for our budget, and it’s good for the earth! There are times when one of us needs to ask a friend for a ride home from church, or to a rehearsal, or something like that, but folks are always happy to help in that department. We like being able to offer rides to other folks when we can, too. I would love to encourage other folks who live close enough to work and school to consider having just one car, or to consider the possibility of moving closer to their work if they don’t. Very occasionally it complicates our life not to have a second car, but our overriding feeling is that we are very grateful to be able to make do with just one. It really is a blessing in the end! Thank you Hannah, for tracking down photos and sharing your insight on Huntington, your family and your choice to live a car-lite lifestyle. I am part of a one-car family too, but we both work outside of the home. We carpool as far as we can, but since we don't work very close together, I actually have a folding bike that I keep in the trunk, and use every day for the second part (better part!) of my commute. It's such an easy way to get along with one car, and the bike folds so easily that it's faster than taking a bike off a car rack. (And we don't have to drive around with something blocking our trunk either). I love the idea of a folding bike. We consider one as a way to make busing easier but didn't see how we could attach child seats. Is this possible/practical? I love that you found a compromise with the car/bike situation that works well for your family.